had chosen the theme of “A Tag with a Tag”. In my words, “Two Tag Tuesday”, now how fun is this? 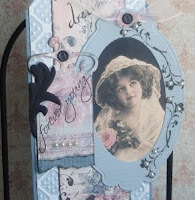 For my tag, I used a graphic from “Magic Moonlight”, four different Spellbinders dies, stamps are from Inkadinkado, See D’s. The background is Cuttlebug Smoosh. Very subtle colours but with lots to look at, very nice indeed! So Pretty! Your Tag has a Vintage Look and the pretty blue colors and embellishments are really nice! Lovely. So soft and delicate and ohhhhh soooo Lovely! Your art always is Vada! A very romantic tag, looks beautiful. Wow, so romantic and vintage and beautiful! Love it! Love your vintage tag. Gorgeous frame for the image. Beautiful Vada! Love the framing around the little angel! Is your tag on the tag a Spellbinders cut off on one end? If so, your are brillian! If not, you still are, because you gave me a great idea! Hugs to you and those are warm ones! What a beautiful Tag you have created.. I just love the Vintage image you used.. Well I should have said I just love the whole Vintage feel this tag has.